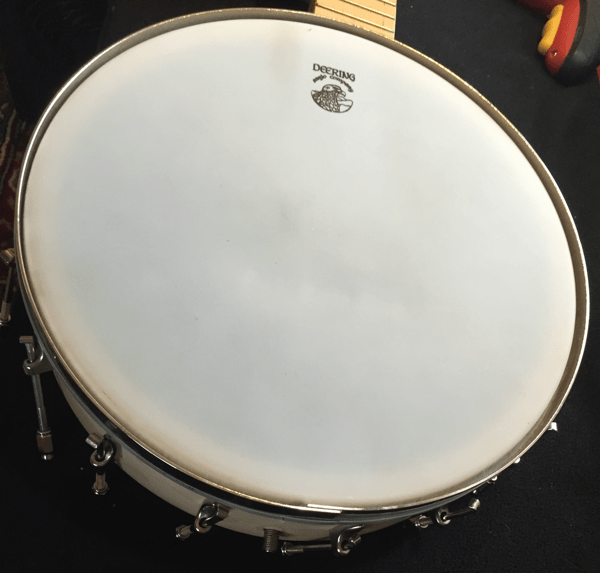 I’m still loving the Goodtime open back banjo I recently purchased. But I wasn’t entirely satisfied with the sound when I bought it. I’ve been experimenting with typical mods often made for a more old-time sound. Specifically, I changed the head from the top-frosted Deering head (actually a Remo Weatherking made for Deering) to a Renaissance head. I changed the tailpiece to a No-Knot style and replaced the strings with Aquila Reds Nylgut, a modified nylon string. The first step is to remove the strings, the original tailpiece and loosen the j-hook brackets which hold the head onto the body. The image below shows the banjo with the j-hooks loosened. I haven’t removed them from the shoes but you may have to or find it easier to do so when removing the head or putting the new head back on. You still won’t be able to remove the head. First you have to loosen the neck in order to get the tension hoop off. 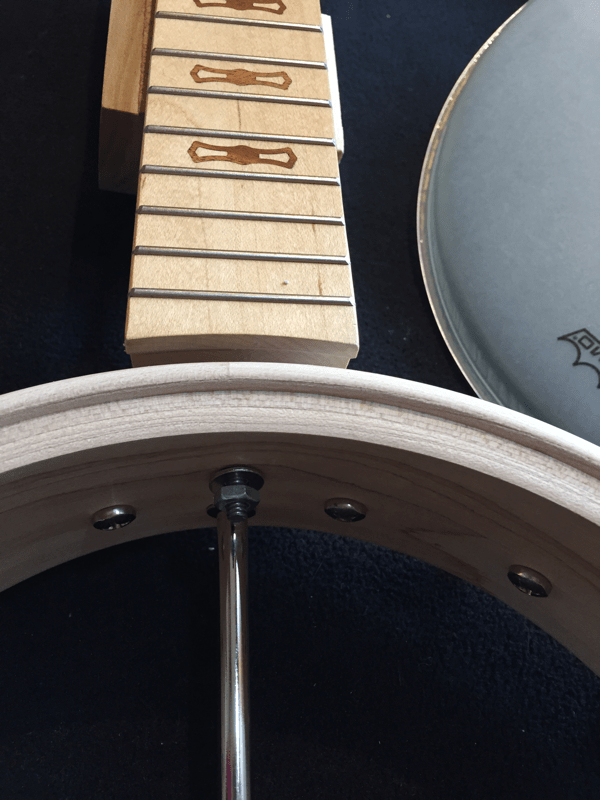 The neck doesn’t have to come all the way off, just enough to get the tension hoop past the neck. Before you do, notice or mark the orientation of the tension hoop so you can put it back the way it came off. The part where the metal is welded/soldered together is usually going to be beneath the tailpiece. Loosen the coordinator rod and the bolt below the rod. The next image shows the neck loosened and the head removed. 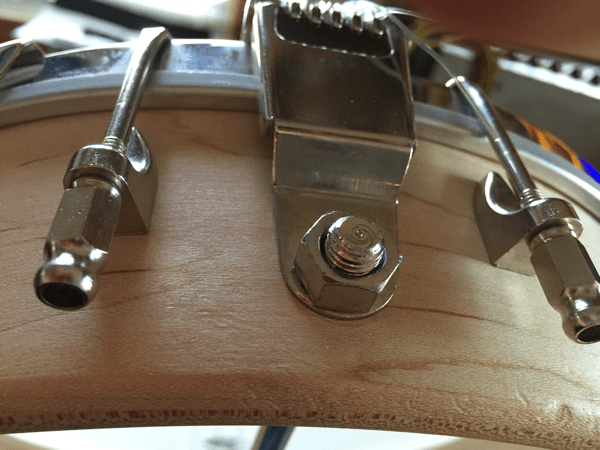 Because the view is from the top of the banjo, the coordinator rod is below the other bolt that must be loosened. Installing the replacement head is straightforward — it is mostly the reverse of what you did to remove the old head. Fit the new head over the wooden pot. Make sure it is pushed down evenly on all sides. Fit the tension hoop over the head. Make sure it is oriented the same way you found it on the original head. Begin hooking and tightening the j-hooks over the tension hoop. This is probably the most difficult and time consuming part of replacing the head. Start with a pair of hooks that are opposite each other. It may be difficult at first to get the hooks over the tension hoop because the head isn’t seated far enough onto the pot. Continue attaching the j-hooks in opposite pairs in an even pattern similar to how you tighten bolds the wheel of a car (presuming you’ve ever changed a tire). You should take many iterations of evenly tightening the j-hook brackets around the pot. I adjusted to what felt like equal tension by feel but I approached that point in small steps. Don’t try to tighten the brackets all the way in one or two steps. Re-tighten the neck to the body making sure the neck is properly aligned. Slip an L angle bracket over the threads on the exterior portion of the coordinator rod and re-attach the nut. This is required to hold down the No-Knot tailpiece. 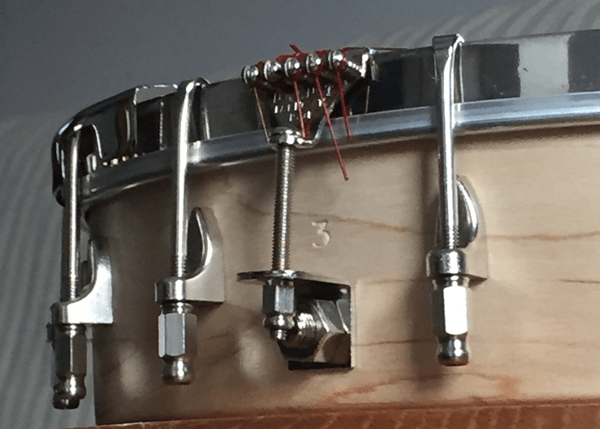 If you’re going to use nylon (including Aquila Nylgut or Reds – anything other than steel) then before attaching the No-Knot tailpiece you should make sure there are no burrs or sharp edges. Many of the reproductions of this style tailpiece were made with steel strings in mind and can cut/break nylon strings. I smoothed all the edges with emory cloth before attaching the tailpiece and so far haven’t had any broken strings. I found the tension of attached strings was as much a factor in holding the No-Knot tailpiece in position as the L-bracket and bolt. The original purpose of the No-Knot design was to allow the attachment of gut strings without having to first tie a loop in the end of the strings. You can still do this with nylon strings if the string gauge is thin enough. Slide a new string into the center slot of one of the string pins of the tailpiece such that only a small bit of the string is sticking out of the bottom of the slot. Then wrap long end of the string around the pin clockwise 360 degrees. The long end should pass over the short end that sticks out the bottom. As long as you hold tension on the string, it will be secure. I discovered that the 4th string (“D” string) was too thick to fit in the slot. I therefore tied a loop in the end of the string. All the other strings in the Aquila Red set fit in the slot. You’re not done yet. You still have to setup the banjo for proper playing. You will have to place the bridge — you may need to widen some of the slots in the bridge for nylon strings. You have to check and maybe adjust the neck angle. And you will have to check the tension. See my post on setup for instructions for these steps.